People often tell me that for an artist, I have a good understanding of business. I would hope so! 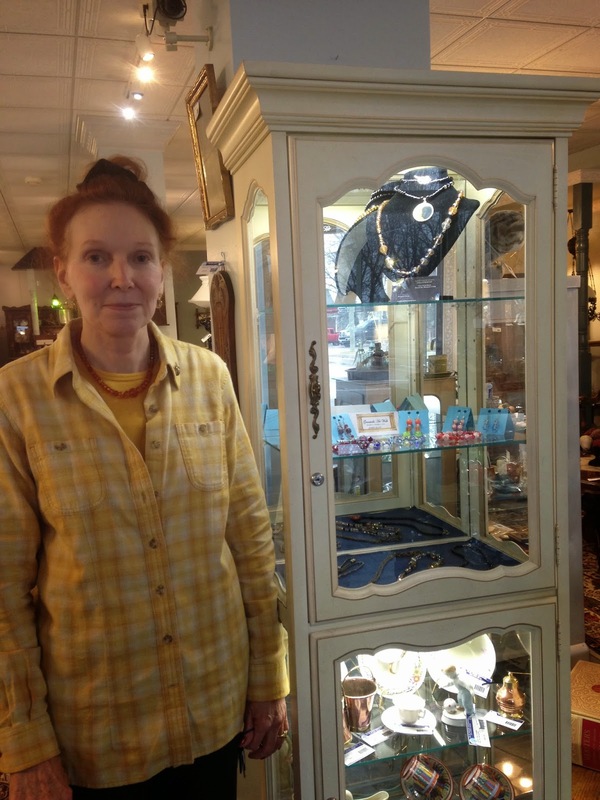 I started working at the flea market in Sapulpa, Oklahoma at the age of seven. I was paid two dollars a week under the table for my labors. I got first real job at the age of 15 as a teacher’s aid and part time art teacher at a summer school program. The Private Industry Training Council of Sapulpa teamed local businesses with disadvantaged youths and helped pay part of our salaries. So I owe my first job, and it was a job in the arts, to the willingness of businesses to work together to help the children of a small town get a chance to shine. I am very happy to say that I have been able to pay that gift forward. I now live in Grantsville, Maryland and I asked several businesses in Grantsville if they would be willing to take part in an inaugural Art Walk. Fifteen businesses said, “Yes!” They are hosting guest adult artists and the work of local students. The art was on display during business hours from November 13- December 11. At the close of the Grantsville Art Walk, an art reception and silent auction will be held 5-7pm on December 11 at Penn Alps Restaurant in Grantsville. It will be open to the public. The funds raised by silent auction will go to the various charities chosen by the artists. 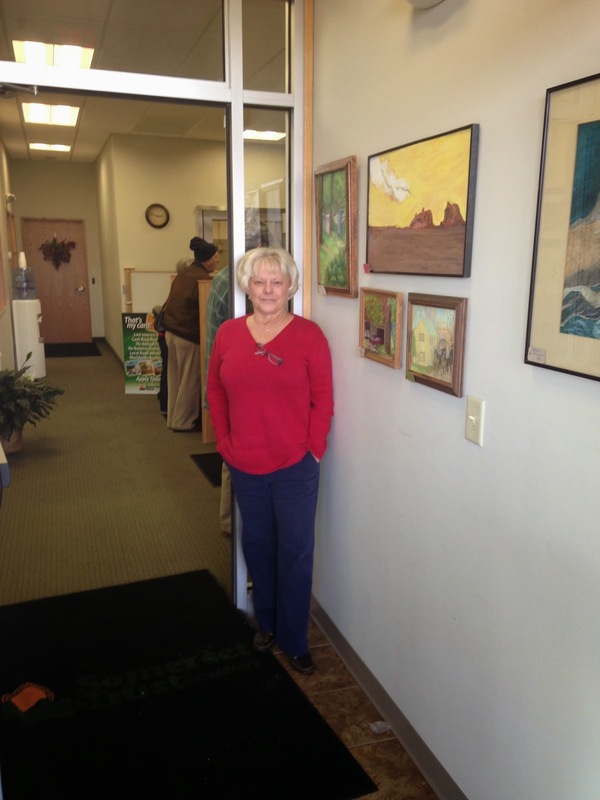 Green Valley Foods hosted Watercolorist Connie Stark. The funds raised from the auction of Connie’s piece “Amish Farm” will go to Hart for Animals of Garrett County. 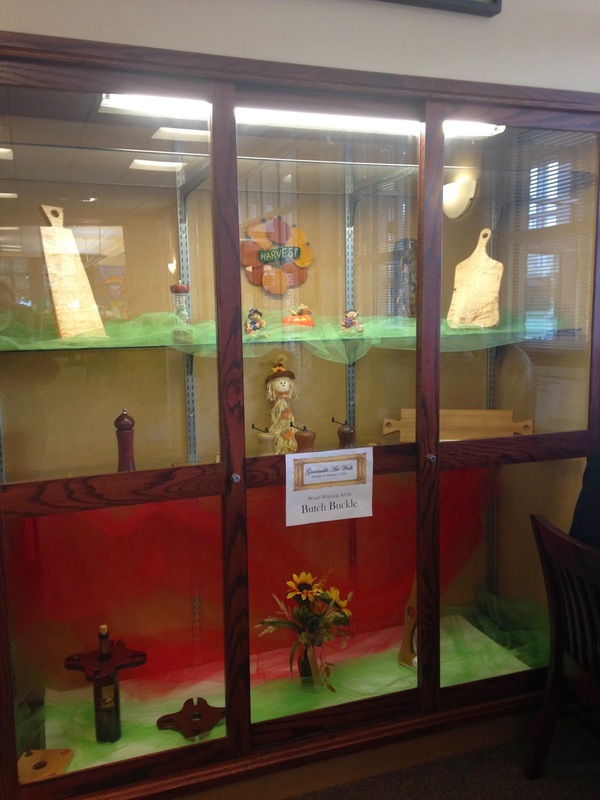 The woodworking of Butch Buckel was displayed at the Ruth Enlow Library. Butch is donating the proceeds from his creation to the Grantsville Elementary PTO (Parent Teacher Organization). TheHighland Thrift Shop hosted Photographer Phil Sorensen. Phil is donating two pieces to auction: “Garret County Barn” and “Sunburst” all proceeds will go to Garrett County Mentors. MedicalRehabilitation Systems hosted the painted textile work of Regina Holliday and Joan Holliday. As the work we are showing represents the advocacy movement known as The Walking Gallery, we are donating a materials basket with information about the movement. The proceeds from this basket will go to the Grantsville Elementary PTO. Somerset Trust displayed the paintings of Carolyn Collen DuBose. She is donating “The Barn in Sheperdstown.” Carolyn was the art teacher at Grantsville Elementary and taught elelmentary art of 31 years. Her proceeds will also go to the Granstville Elementary PTO. The work of Photographer Connie Garlitz was displayed at The Republican Newspaper office. “Flower with Hummingbirds” is the piece Connie is donating to support the Rotary Christmas Tree Fund. The students of Grantsville Elementary are participating by displaying class creations in local businesses. All proceeds of the children’s work will go to the Grantsville Elementary PTO to support continued education in the arts. 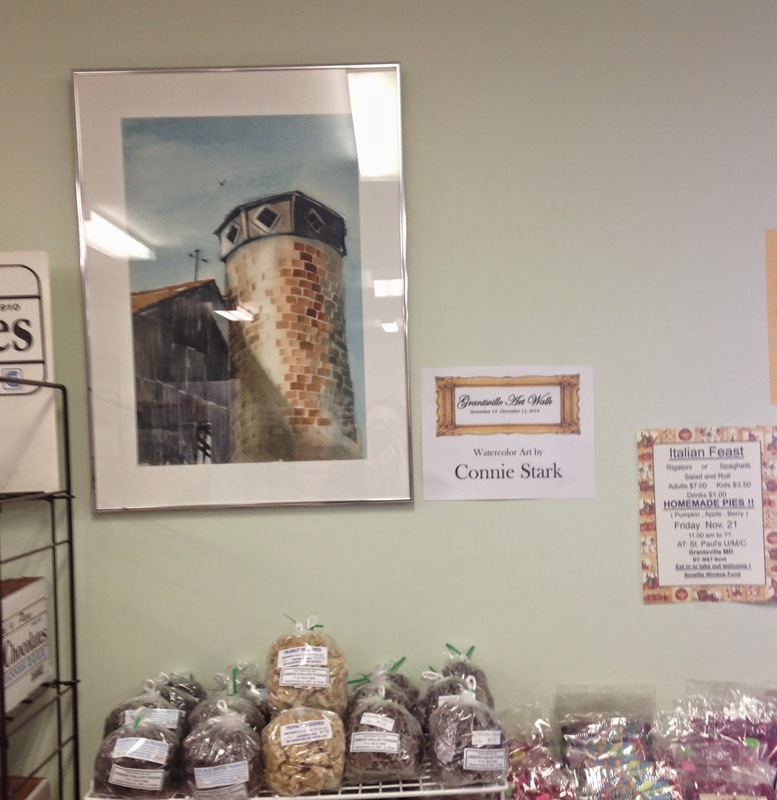 The student work from Mrs. Wampler class “The Four Seasons” was displayed at Buckel’s Laundromat. 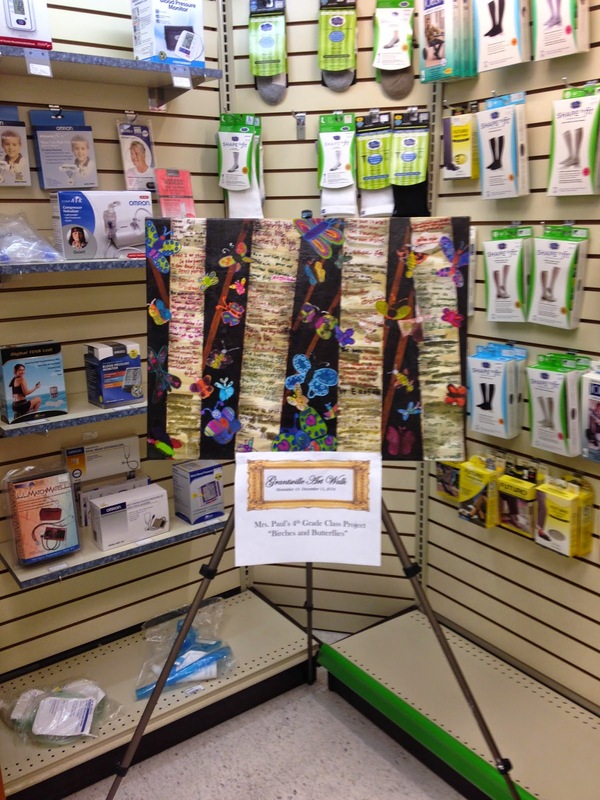 TheMedicine Shoppe displayed “Birches and Butterflies” from Mrs. Paul’s 4th grade class. Four Season’s Stichery displayed “Paper Quilt” by Mrs. Upole’s 5th grade class. Dr.Robin Bissell’s office displayed “Birds on a High-line” from Mrs. Stark’s 5th grade class. 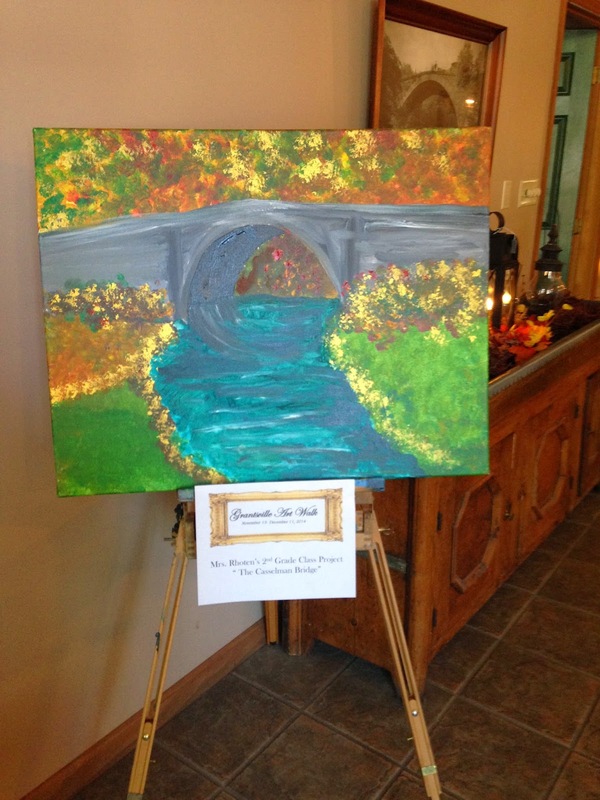 Penn Alps displayed the painting “The Casselman Bridge” created by Mrs. Rhoten’s 2nd grade class. Can you tuck me in? The Grantsville Art Walk was a Success!